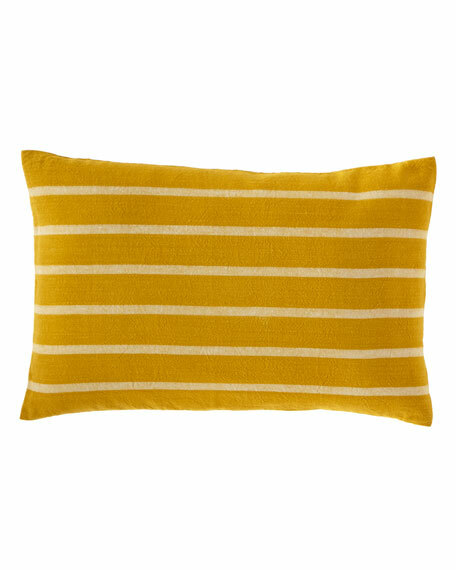 Ralph Lauren Home Morrene Stripe Decorative Pillow, 16" x 24"
Ralph Lauren HomeMorrene Stripe Decorative Pillow, 16" x 24"
A rich yellow hue and bold awning stripes bring this linen-and-cotton throw pillow to life. Pair it with the Parisian-chic prints and textures of the Rue Vaneau bedding collection. Striped pillow with knife-edge finish. Handcrafted woven pillow with art deco era inspired pattern. Cover, cotton/polyester. Down/feather insert. 24"Sq. Dry clean. Made in the USA of imported materials. Handcrafted pillow with crewel embroidery. Cover, polyester/linen/viscose. Down/feather insert. 22"Sq. Dry clean. Made in the USA of imported materials. Handcrafted pillow in printed leaf design. Cover, linen/rayon. Down/feather insert. 24"Sq. Dry clean. Made in the USA of imported materials. EXCLUSIVELY AT NEIMAN MARCUS Leopard-print pillow. Approx. 20"Sq. Linen/viscose; feather fill. Dry clean. Made in the USA of imported materials.